The October edition of Wood News is available – take a peek! This month we’ve got great articles and product deals, as usual. Starting with the Down to Earth Woodworker – Steve Johnson considers the future of woodworking in his typical eloquent fashion, as well as addressing practical concerns for the present, including some sound safety tips and a great how-to video and demonstration for building a better bench hook. Our Show Us Your Shop column features Luke Cabanel’s beautiful timber frame workshop, and Show Us Your Stuff offers up the impressive craftsmanship of Harold Burrows, including a gorgeous dentil build-up molding on a cabinet with a soapstone top. Mickey Hudspeth builds his own power tools, and those tools and his shop are featured in the article The Incredible Homemade Workshop. 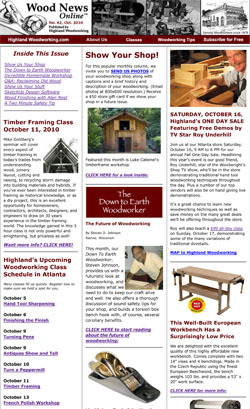 Alan Noel has a new finishing column and Sean Headrick is back this month with his Sketchup column, plus we have a newly updated class schedule and a truckload of deals for you – all in the October Wood News. Go check it out!